This time the spotlight will be shining on Urban Pirate, a game which lets you, well, become an urban pirate (surprise!). Let’s help it escape the cold, lonely emptiness of Greenlight limbo, eh? 2d, turn-based, urban crime sim. A non-linear adventure in a modern world of piracy. A radical mix of Strategy/RPG/Sports & Simulation. If there ever was a game designed around escapism, this’d be it. Not even joking. Crazy thing has “shoplifting, skateboarding and dumpster diving” on its feature list, after all. What do you mean “not really my idea of a good time”? It’s a video game – relax, explore new territory, think outside the box for once, eh? 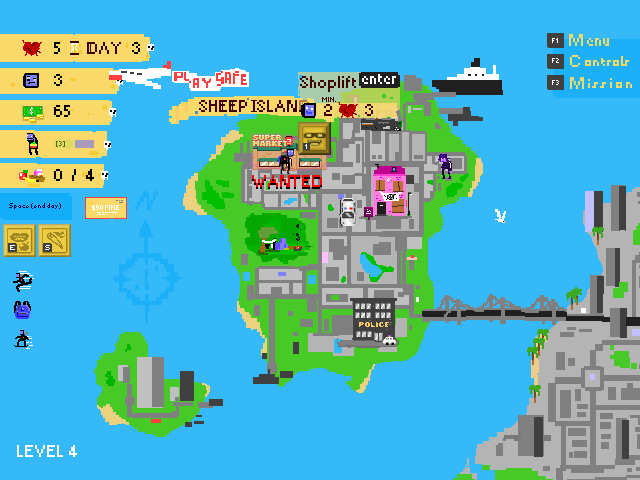 Besides, what’d you really expect from a game called Urban Pirate? In all seriousness though, it may seem a tad odd to some, but me – I’d say it’s more unique and intriguing than anything else. Also, raving and rioting are on the menu too. Fight the power! Stick it to the man! So riddle me this, dear reader: why is Urban Pirate still struggling to get through Greenlight? It’s not out just yet save for a demo, but even so… how about visiting its Greenlight page and handing over a ‘yes’ if you like what you see? Remember: your vote could be the one that grants it access to Steam!